This is one of the Marcoses’ greatest achievement aside from the greedy 20 years in power and other anomalies and atrocities. 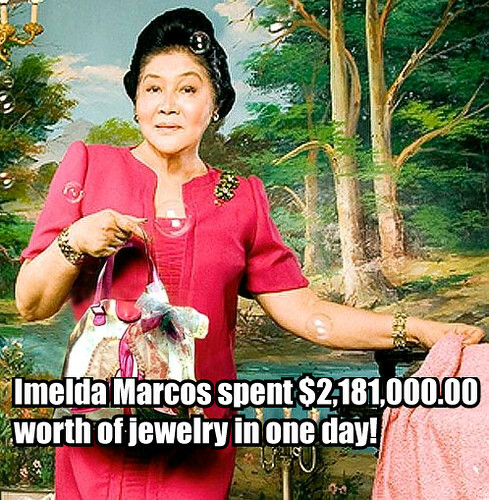 In 1978, Imelda Marcos spent $2,181,000.00 in one day! This included $1,150,000 for a platinum and emerald bracelet with diamonds from Bulgari; $330,000 for a necklace with a ruby, diamonds, and emeralds; $300,000 for a ring with heart-shaped emeralds; $78,000 for 18-carat gold ear clips with diamonds; $300,000 for a pendant with canary diamonds, rubies and emeralds on a gold chain. For more of the Marcos plunder list visit the Asian Journal.